Hosting Thanksgiving? Be Company-Ready With 3 Simple Tips! Hosting Thanksgiving This Year? Get Your Home Company-Ready With 3 Simple Tips! We’ve all been there. The mad “get the home clean” dash that happens just before company arrives…Vacuum, dust, shove those shoes in the closet, baste the turkey, pick up toys, yell at your family, clean off ceiling fans, chop the onions, tell your kids to sit still and not touch anything, clean up dog hair, scrub down the bathrooms, saute vegetables, get presentable, continue to cook, bark more orders at your family…You know. Pure and utter chaos leaving you all exhausted and overwhelmed by the time your guests ring the bell. We’re here to tell you this year CAN be different and it will be, by following these 3 simple tips to get your home ready, starting NOW! With a few weeks left before Thanksgiving, devising a realistic cleaning plan that targets various high-priority areas of your home will allow you to simply touch up the day of rather than be bogged down by a deep-cleaning nightmare. Best of all, by focusing on one room or spot at a time before the holiday arrives, you and your family won’t feel as overwhelmed, providing more time to enjoy festivities and football, together! 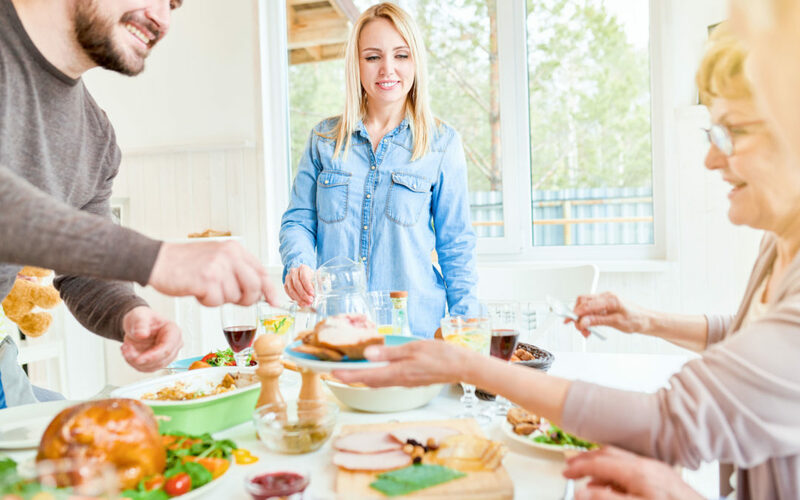 If you have a large group joining you for Thanksgiving, you may need to move some furniture items around to accommodate. If your home is fairly large, re-positioning items isn’t a problem, but for those of you who reside within a typical home or apartment, finding creative ways to make space can be a challenge. Consider renting a self-storage unit nearby to store items during the holiday season and beyond, allowing you to maximize living space when company comes over and throughout the entire year. Other than your Turkey or Ham, prep and cook side dishes and appetizers in advance to simply reheat the day of. With a plethora of delicious make-ahead recipes available, your company won’t know the difference, but your stress-level will! Remember, Thanksgiving isn’t about perfection, but about expressing gratitude for all that we have. Our families, our friends, our health, our provisions and our safety. It’s a time to reflect on our blessings and the gift of life, we all too frequently take for granted. Wishing you a beautiful Thanksgiving season, filled with appreciation and love!